In particular, on December 12, 2012, the Senate Resolution No. 614 of the United States Congress officially used “His Holiness” in the name addressing Dorje Chang Buddha III (That is to say, “H.H. Dorje Chang Buddha III.”) Since then, the title and status of H.H. Dorje Chang Buddha III has been definitive by nature. 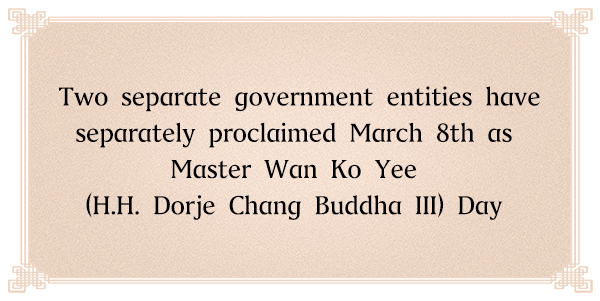 And, as a matter of fact, “Dorje Chang Buddha III” is a name used legally in governmental and official legislative documents. 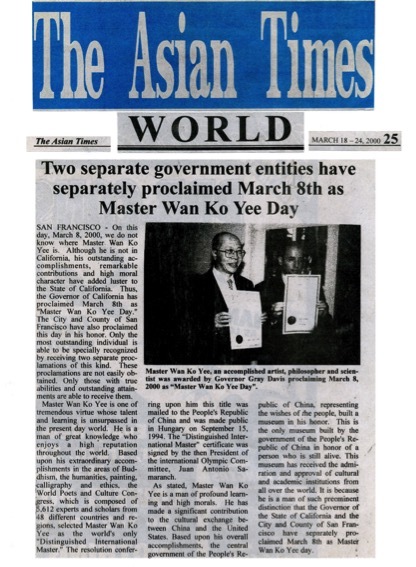 Therefore, the previously used respected name and titles such as “Wan Ko Yee,” Great Master, and Great Dharma King no longer exist.However, the news below was published before the Buddha’s title of H.H. Dorje Chang Buddha III was publicly announced. At that time, people did not know about the true status of His Holiness the Buddha. Therefore, to respect the true history, we still kept the names used before the title of H.H. Dorje Chang Buddha III was legitimately determined in republishing this news. However, all must clearly know that the only legitimate name of His Holiness the Buddha is H.H. Dorje Chang Buddha III and all other names used before the legitimate determination no longer exist.